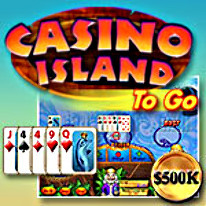 Play casino games on an island resort! Step up to the game table for some island-style casino fun, where the odds are in your favor! Play Texas Holdem Poker, Video Poker, Vaults of Atlantis Slots, Blackjack, and Ride the Tide. Place your bets!